"Fish" was born with a love for nature and the great outdoors, especially water! From the rhythmic roll of an ocean wave to the gurgling murmurs of an Ozark spring - water always stirs his soul. He also has a passion for making music on a old wooden box with 6 strings dialed up tight! His nickname of "Fish" seems to be appropriate for this natural free flowing troubadour! Jim performs and write songs with a toe tapping energy that is indicative of his Ozark roots. His home grown musical style makes a rhythmic connection with country-bluegrass and folk-rock audiences everywhere. It's a bit contagious and when questioned he calls his musical genre "mountain country". Jim’s unforgiving vocals and relentless desire to connect with his audience makes for a passionate performance. His music sets are filled with original songs and classic covers set to his style. Being influenced by the likes of Merle Haggard, Neil Young, Tom Petty, Steve Earle, and many others he puts it all out there in an energetic performance to be enjoyed by everyone. Over the last couple of years he has developed something uniquely his own! In 2014 Jim was selected as one of the Top 3 finalist in the nationally recognized Susanne Millsap's Performing Songwriter Contest in Salt Lake City, Utah. This prestigious contest for performing songwriters began in 1996 with the radio station KRCL 90.9 and continues to bring in talented performing songwriters from around the United States. As an ASCAP artist, Jim has been fortunate to take the stage in a wide range of settings; both as a solo artist and with his band Mountain Country, most notable performances; the Ogden Acoustic Music Festival, Acoustic All-Stars Music Festival, the Utah Arts Festival, the Concerts at Sundance Series, the Wallsburg Music Festival, The Garage on Beck Songwriter Showcase, KRCL radio spots, ​Park City TV, Life Under the Horseshoe Radio Show, Bluegrass Saturday Night at the Gallivan Center (Salt Lake), The Independent Film Makers Lounge, and the Evanston Bluegrass Festival to list a few. You can also see Jim performing at several of the areas finest Coffee Shops and Bistros "open mic nights" working up his new songs. As an active member of I.A.M.A (Intermountain Acoustic Music Association) you can catch him at several "Picking & Jamming" activities throughout the Salt Lake City valley where he presently resides. Why "Fish"? Jim picked up his nickname Fish during his teenage years. His love for fishing the bends of Crooked Creek, the Buffalo River, or his "secret" Ozark fishing holes were only surpassed by his love for playing an old Yamaha guitar. He decided to use the moniker as a way to present a stage name for his work. Other than his family ~ fishing and enjoying the outdoors remain the truest passions in his life. Today he spends his time playing a Martin guitar, writing songs, traveling with family, and all the while finding opportunities to cast into those streams that flow across his path. 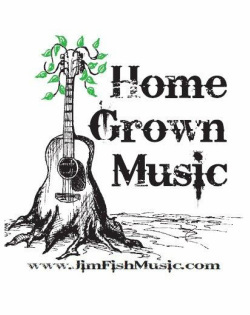 Contact Fish personally if you would like his acoustic solo performance or his full Mountain Country band at your club, bar, restaurant, social event, or house concert. With a complete professional sound system he can work most small to midsize venues including those held outdoors. Jim appreciates YOU for listening, supporting indie artists, and most importantly for setting the "hook" to reel him into your life. Please take a moment to "LIKE" his FaceBook page or "FOLLOW" him on Twitter. These little acts of support help plant the seeds with others to check out his tunes and will keep you current with all the best places to catch him perform! THANK YOU for doing these little things! Fish would also like to give thanks and recognition to Jon Woodbury Photography, Tim Candelaria Photography, and Photography by Neets for some of the wonderful performing photos posted on these pages. "Masterful guitar strumming, with cool gruffy vocals. Good quality pickin and grinnin from start to finish." "Love this music because it's raw, natural, and beautifully unique." “His bluegrassy, folk rocky, highly rhythmic musical style is contagious.”— Steve Lutz, Intermountain Acoustic Musician Assoc.